A human rights discrimination complaint was filed last week against a New Mexico convenience store, alleging it denies service to Muslims and posts signs on its windows with racist and bigoted language. Lena Masri, litigation director at the Council on American-Islamic Relations (CAIR), a civil rights and advocacy group, said it made the complaint on Wednesday against the Mayhill Convenience Storewith the New Mexico Department of Workforce Solutions. 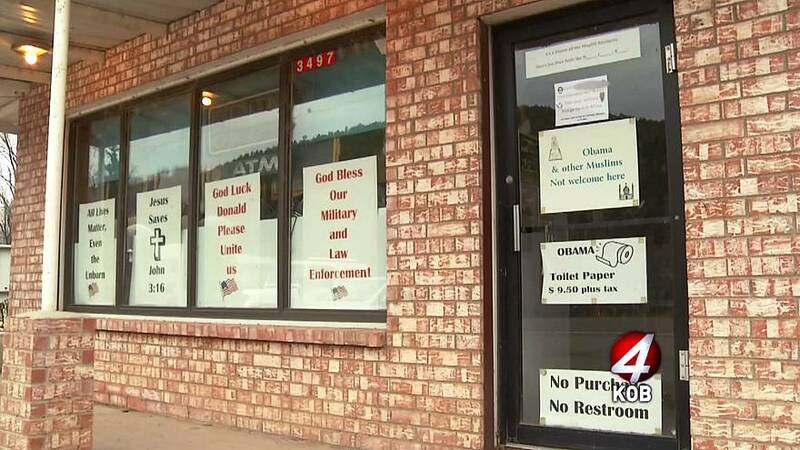 CAIR accuses the store of putting up a number of signs, including one that said in bold lettering, "Obama & other Muslims Not welcome here," and that depicted a mosque and a Muslim man praying. "The civil rights movement sought to eliminate discriminatory signs denying service to members of the public based on their race, religion or national origin," Masri said in a statement. "We must ensure that we do not allow the bigotry of the past to resurface and be normalized in the form of Islamophobia." Erin Thompson, deputy cabinet secretary of the New Mexico Department of Workforce Solutions, confirmed to NBC News that her agency's Human Rights Bureau received the CAIR complaint, on behalf of an anonymous individual, by fax on Dec. 13. She said a complaint typically goes through an intake process, during which it's evaluated for "accuracy and basis." Once it's determined that it meets that criteria, it's sent to the individual against whom the complaint is being made, Thompson said. "They can respond, and at that point, an investigation begins," she said. Customers are among those who can file such complaints, Thompson said. Penalties can be assessed after an investigation concludes, she added. The Mayhill Convenience Store, located in the small community of Mayhill, around 165 miles southeast of Albuquerque, made headlines in January for the signs posted in its window. Thompson said the New Mexico Department of Workforce Solutions had logged one previous complaint against the store. Efforts to reach the Mayhill Convenience Store for comment were unsuccessful. A phone number that was listed for the business was not in service.